This is the ads that appeared worldwide newpapers. The HP-41 handheld computer was chosen by NASA as a regular member of the Space Shuttle team. If you need be, it cah help land the Space Shuttle without the help of Mission Control. The HP-41 is an extraordinarily powerful handheld computer all by itself. When combine with peripherals, it becomes the hart of the complete personal computer system. 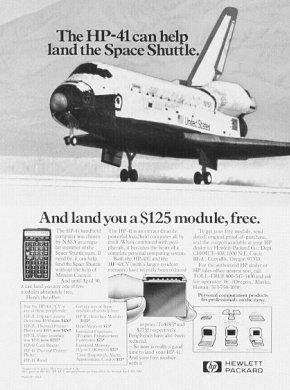 Caption: The HP-41 can help land the Space Shuttle. And land you a $125 module, free. Note: HP-41 were used aboard the Space Shuttle Columbia. There are also a few pictures showing them in use. One article described that the HP-41 was used to calculate deorbit-burn information, should data coming from mission control be interrupted or during an emergency. Two other programs helped balance Columbia prior to re-entry and another to pin-point Earth observation sites. The HP-41�s did not take place of the larger on board computers, but complemented them with personal computer convenience.